Saffron (Crocus sativus L.) is an herbaceous, perennial and infertile plant which reaches a height from 10 to 15 cm. It is reproduced by corms (short and thick stem similar to the onion bulb but which is not made up of concentric layers). Saffron adapts to all type of soils and it supports very extreme temperatures ranging between 40 ºC in summer and -15 ºC in winter. Its hidric needs are estimated between 600-700 mm. This plant blooms in autumn when all other plants prepare to protect themselves against the rigors of winter. Saffron spice is made up of the Crocus sativus L. dried stigmas, in filaments or in powder form. Saffron flower has one bright red stigma divided into three filaments remaining united through a small portion of orangy stigma. This spice is valorised by its colouring, flavouring and aromatic strength. The responsible components of these properties are a crocetin ester-group, the picrocrocin and safranal among others volatile compounds, respectively. The time that the crop remains in the same plot ranges, depending on the country, from four years (in Spain) to seven years (in Greece). Once this time has elapsed the crop is lifted to rejuvenate it. In saffron cycle, it is possible to distinguish two main stages: activity and resting stages. During the activity stage, from August to April, the plant restart its metabolic activity (activation phase) and also flowering, rooting, sprouting, foliation and stooling phases take place. Maximum saffron stigmas yield is obtained during the second and the third flowering and it starts to decrease from the third year. Resting phase include dormancy and maturity phases (It is the moment when the corm reaches its definitive aspect and size). 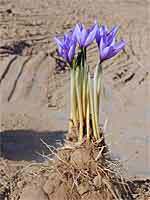 During the resting phase is possible to clean and replant the corms in other fields which have not been cultivated with saffron at least during eight years.